This month Carniverous Boyfriend has decided to ramp his protein obsession up a notch by moving onto a strict no carb diet. A kind of crazy cross between Atkins and Dukan, it’s intended to turn him into a lean, mean, muscle-beach-bound machine in time for our trip to Spain in early June. Good for him. Possibly a little less good for me as I’ll no longer have a partner in crime to share the breads, brownies and other spoils of my baking obsession. Never mind, I guess my inner greedy child should see that as a positive anyway. On another positive note, this new-found protein obsession means I’ve been experimenting a little more in the kitchen. Although CB seems pretty content to chow down on multiple chicken breasts, tins of tuna and dozens of eggs, I think it’s nice to tuck into something a little more adventurous of an evening. This weekend, I stuck my nose into our local fishmonger and came back laden with beautiful specimens; a crab shell packed with freshly picked meat, a dozen giant head-on prawns, thin opaque fillets of gurnard, some gorgeously glossy squid tubes and a little pot of tiny peeled prawns. 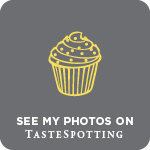 One of my favourite blogs at the moment is Food Stories written by Helen Graves. 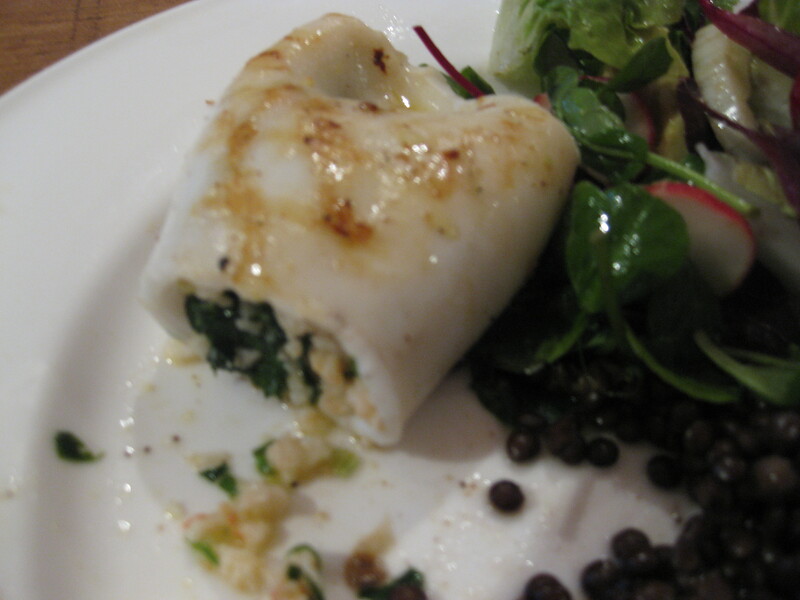 I’ve been eyeing up her various recipes for stuffed squid for a while now (recipe here), and thought this was the perfect opportunity to give it a go. Squid is one of my all-time favourite ingredients – flash-grilled with chilli, lemon and rocket a la River Cafe or slow-stewed with soft, melting ingredients like fennel and chorizo – but can be so easy to get wrong. A few minutes over or under and the resulting rubbery consistency is as pentitential as it gets. I was therefore a little concerned as Helen’s recipe called for baby squid, and my tubes were more of the giant variety. However a little common sense prevailed and I got the cooking time pretty much spot on, creating a dish of wonderful contrasts – melt-in-the-mouth squid packed with firm, textured prawns and punchy flavours. What follows is recipe I pulled together using a few basic ingredients – pungent crushed garlic, fiery chilli, a zing of lemon and freshly torn parsley. If I hadn’t been under strict no-carb intructions from CB, I’d be inclined to throw in a handful of breadcrumbs or pulses (lentils or the black beans that Helen uses would be good) to help bind the filling (it slightly fell apart as you cut into the tubes), but if you’re looking for simple, strong flavours over presentation, what follows is more than adequate. My photo of the finished article is a little dodgy as by this point I was more interested in eating than snapping, but please take my word for it, these really are very nice. Perfect with some steamed woody green veg and a splash of fruity olive oil. 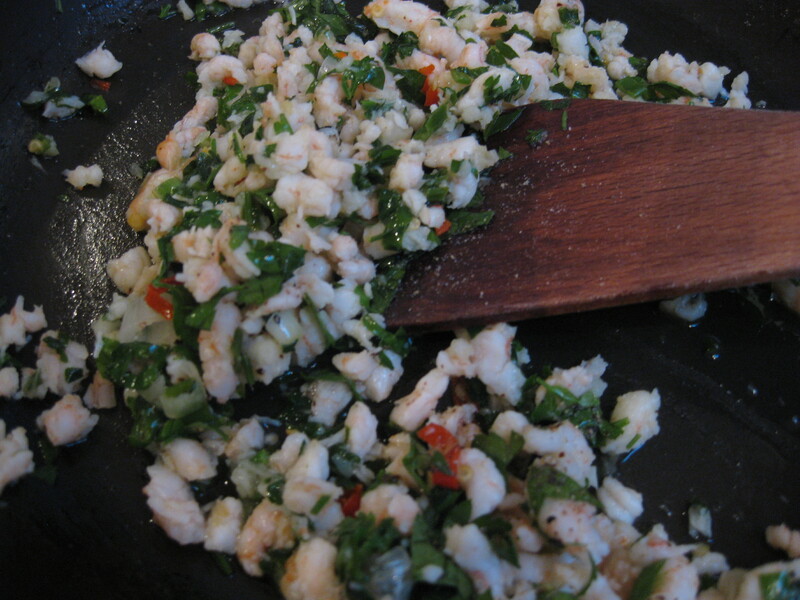 Heat a lug of olive oil in a small saucepan and gently fry the crushed garlic and chilli til coloured. Add the pinenuts and prawns and continue to cook a couple more minutes. Remove from the heat and stir in the lemon juice, parsley and breadcrumbs/lentils if using to form a thick, coarse mixture. Stuff each squid 3/4 full with the mixture, securing the end with a cocktail stick. Heat a heavy based grill pan with a little oil until smoking, then grill the squid for around 3 mins each side, adjusting depending on the size of your tubes. This would also work really well on the BBQ, with the black grill marks adding extra flavour. Test that the contents are warmed through by inserting a skewer. Serve drizzled with fruity olive oil and accompanied by earthy rich greens. Sounds great, can’t wait to try it :).Thanks heaps, I have been trying to find a low carb recipe this is perfect. Ah, my pleasure – enjoy!